Dental implantation becomes common and widespread for dental reconstruction and filling defects of dentition by means of implant supported fixed dental prostheses. This method is used in case of inability of application of conventional types of prosthetics (partial or complete removable dentures), and also for attainment of optimal functional long-term patient’s rehabilitation and obtainment of highly aesthetic result of treatment. Implant supported prosthetic constructions have the range of advantages as compared with traditional fixed dental prostheses (“bridges”) and removable dentures. First of all, it is concerned with the way of occlusal load distribution. While using implant supported prostheses such loading is transmitted more physiologically, evenly distributed in bone tissue of the jaw without overload of surrounding teeth and without unfavorable influence on oral mucosa covering alveolar ridge causing its subsequent atrophy (in case of removable dentures). Thereby early and timely manufactured implant supported fixed dental prostheses allow to fill defects of dentition, formed as the result of tooth extraction, and moreover to provide bone tissue preservation in the region of defect to prevent its atrophy. But more often than not the possibility of providing dental implantation is limited by the peculiarities of the anatomical structure of the jaw. As a rule, tooth loss in posterior mandible is accompanied by expressed bone loss as the result of the absence of physiological loading. Thus the size of available bone is insufficient for implant placement. The localization of the mandibular canal, innervating (sensory and efferent) mandible and surrounding soft tissues and muscles, creates certain difficulties for dental insertion in this area and may cause unfavorable consequences in the form of neurosensory deficiency of soft tissues and efferent disturbances of masticatory muscles. To prevent possible complications and to create conditions for implant placement in such cases the method of bone augmentation with osteoplastic materials [1, 18, 20] and different methods of the inferior alveolar nerve transposition [19, 21] are conventionally used. Such methods represent separate surgical procedures themselves having definite risks. Thereby implant placement can be provided only after waiting period (6 month and more) in such cases, extending general terms of patient’s rehabilitation. To solve this problem of clinical dentistry it was offered to place implants by the angle (tilted position)detouring mandibular canal, but not in axial position, to prevent injury or compression of inferior alveolar nerve. Clinical investigations [4, 5, 25, 36-39] proved the possibility and reliability of this technique. MizbahK. et al.studied the clinical relevance of bifid and trifid mandibular canals and the variables of its branching in the middle part of mandible, that should be considered on all phases of the implant treatment [29, 30, 32] (Fig. 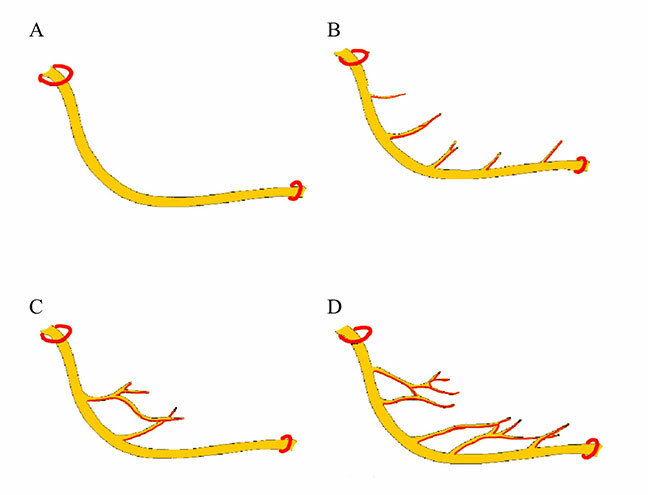 1).Kieser J. et al.developedthe classification of branching patterns of the inferior alveolar nerve (Fig. 2). Fig. 1.Reconstruction with nerve tracking showing the bifid and trifid mandibular canals (Mizbah K. et al., 2012) . Fig. 2.Branching patterns of the inferior alveolar nerve: classification by Kieser et al. : A – single unbranched nerve; B – series of individual branches to the superior border of the mandible; C – fine molar plexus; D – proximal and distal nerve plexus. Implant placement in atrophic mandible requires thorough preoperative examination for obtaining clear conception about the peculiarities of mandibular canal localization inside bone tissue in each clinical case[16, 23]. Panoramic radiography gives only common concept about anatomic structures and remains effective in particular cases[7, 9, 15]. Computed tomography is needed in the complex anatomo-topographic conditions, allowing to investigate the area of planning implant placement in layers [3, 6, 10, 11, 17, 38] (Fig. 3) and to prepare navigation surgical template [8, 24, 28]. Fig. 3. 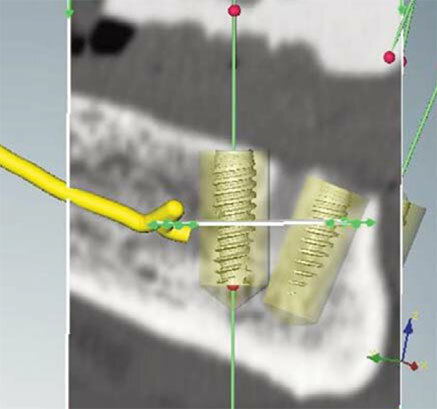 Virtual planning of implant positioning using CT (De Vico G. et al., 2011) . Recently, the effectiveness of using immediate and early loading of implant supported fixed dental prostheses was proved by the results of clinical studies [2, 26, 27, 33-35]. It was confirmed by the data of the dynamics of bone loss near implants which does not exceed allowable limits. 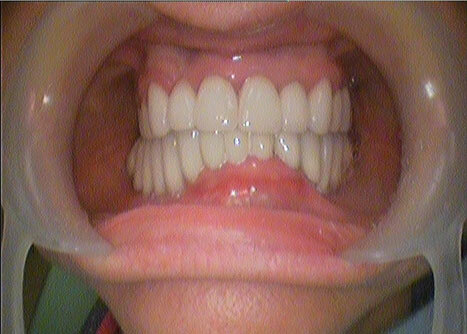 In this way, the placement of dental implants detouring mandibular canal allows to expand the indications for providing dental implantation in atrophic mandible significantly, to reduce the terms of patient’s rehabilitation and to obtain long-term functional and esthetic result of treatment, and also to avoid the necessity of additional surgical procedures. In support of previous statement, the object of our research was complete dental rehabilitation of patient with severely atrophic posterior mandible using the method of placement tilted dental implants detouring important anatomic structures, such as mandibular canal and the inferior alveolar nerve. Patient L., female, 58 years old, with the partial defect of dentition in posterior atrophic mandible was consulted about possibility of dental implantation and fixed prosthodontics. There is fixed dental construction on the mandible, supported by teeth 42, 41, 31, 32, 33. The opposing maxilla has permanent metal ceramic fixed dental prostheses supported by teeth 17, 16, 15, 14, 13, 11 and 21, 22, 24, 25, 28 (Fig. 4). The CT examination proved the bone tissue of type I according to the Lekholm and Zarb classification in this case.The posterior regions where the implants are planned to be inserted the alveolar crest was 10,57 mm in width and 11,90 mm in height. The distance between the cortical plate and the mandibular canal was only 4,91 mm.Such minimal extent of the bone on the side area in the posterior mandibular region allows to place narrow implant with 3,0 mm in width to avoid the contact with the inferior alveolar nerve. Otherwise dental implantation in this conditions is not available without bone augmentation or/and the inferior alveolar nerve transposition. 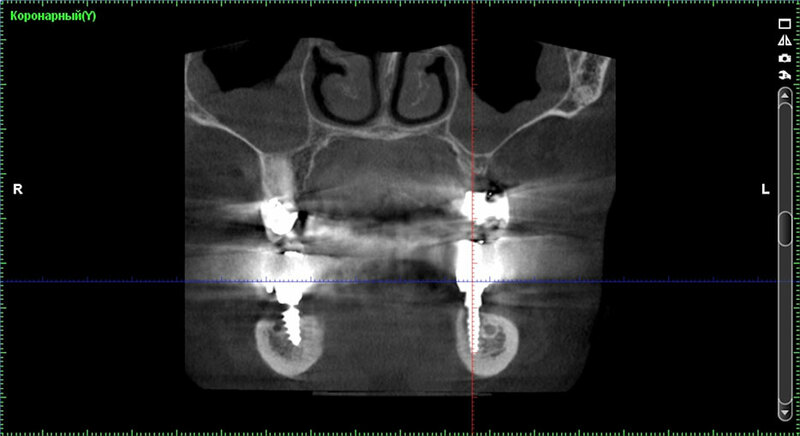 In this case placement of the implants in the posterior area detouring the mandibular canal was only possible after providing of the computer tomography in order to pinpoint the placement of the canal and consequent surgical navigation template preparation.The dental implantation surgery was planned virtually in the DDS-Pro programme using the computer tomography results, model scans and wax-up. It has been decided to manufacture the permanent orthopaedic construction supported by 6 implants. After anesthesia the detachment of mucoperiosteal flap was provided for visualization of alveolar bone ridge. Using manufactured surgical navigation template implant was placed after osteotomy. 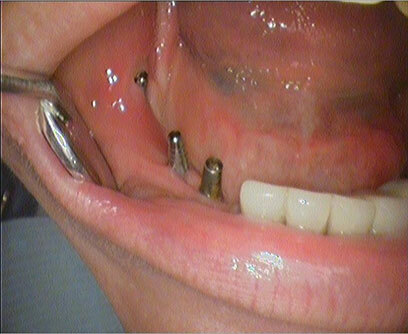 Screw-retained one-step implants with bicortical fixation were placed in the posterior mandibular region by the angle to the axial position to avoid the contact with the inferior alveolar nerve. Bicortical fixation of the implant in this situation ensures initial implant stability. The length of all the endoosseous parts of the implants is 10 mm, the width is 3,0 mm. 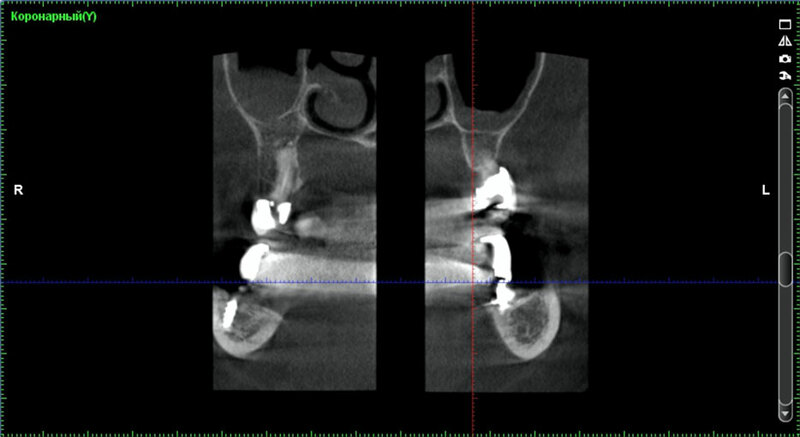 Based on joint treatment planning with CT the decision was made to place additional 2 implants, positioned detouring the inferior alveolar nerve and navigated by surgical templates, and to use provisional fixed dental construction after implantation with change to permanent construction in 6 month after surgery (Fig. 5-11). Fig. 4. Panoramic radiography before treatment. It was clinically checked for implant stability, absence of unfavorable effects during percussion test, the absence of pain syndrome around the implants and absence of neurosensory deficiency. After inserting the implants a computer tomography was done to ensure the correct placement of the implants in the mandible. Immediate functional loading was applied on temporary fixed combined prosthesis with plastic coating and occlusal adaptation which the patient was able to use on the third day after surgery. Fig. 5. Clinical presentation of the oral cavity after implantation. During the orthopaedic step working impressions were procured by using plastic transfers into which implant analogues were installed, followed by moulding the master cast. After moulding the master cast, the parallelometry with the implant analogues was conducted, the lab caps were fixed as adaptive parallelometric keys onto the implant analogues, the caps were dissected according to the method of the construction installation and interjoined them with the dental resin. Fig. 6.Dissecting the implant suprastructure according to the parallelometric keys. Dissecting the implant suprastructure according to the keys allowed for the mitigation of the convergence and divergence of the implant suprastructure and creating the 100% match to the prosthetic construction (Fig. 6). Fig. 8. The computer tomography 6 months after the implant insertion in the posterior region of the mandible. Fig. 9. The computer tomography 6 months after the implant insertionin the posterior region of the mandible: implants inserted detouring the inferior alveolar nerve and mandibular canal. Fig. 10. Panoramic radiography after placement of dental implants in the mandible. Fig. 11. Clinical presentation of the oral cavity after fixation of dental prostheses. By means of CT it was determined that the bone loss around inserted implants is absent around the implant and that the loss of bone tissue during the period of the implant loading does not exceed allowable limits. The method applied in this case allowed to decline the number of surgeries and also to decrease significantly the longevity of treatment with possibility of using fixed prosthetic construction right after dental implant placement. Many similar results have been obtained hereafter. Chiapasco M. Bone augmentation procedures in implant dentistry /M. Chiapasco, P. Casentini, M. Zaniboni // Int. J. Oral Maxillofac. Implants. – 2009. -Vol. 24, Suppl. – P. 237-259. Romanos G. E. Immediate versus delayed functional loading of implants in the posterior mandible: a 2-year prospective clinical study of 12 consecutive cases / G. E. Romanos, G. H. Nentwig // Int. J. Periodontics Restorative Dent. – 2006. – Vol. 26(5). – P. 459-469. Jung R.E. Computer technology applications in surgical implant dentistry: a systematic review / R. E. Jung, D. Schneider, J. Ganeles // Int. J. Oral. Maxillofac Implants. – 2009. – Vol. 24, sup l. – Р. 92–109. Krekmanov L. Placement of posterior mandibular and maxillary implants in pacients with severe bone deficiency: a clinical report of procedure / L. Krekmanov // Int. J. Oral Maxillofac. Implants. – 2000. – N. 15. – P. 722-730. Krekmanov L. Tilting of posterior mandibular and maxillary implants for improved prosthesis support / Krekmanov L., Kahn M., Rangert B., Lindstrum H. // Int. J. Oral Maxillofac. Implants. – 2000. – N. 15. – P. 405-414. Mandibular Canal Location: Cone-beam Computed Tomography Examination / T. Koivisto, D. Chiona, L. L. Milroy [et al. ]// J. Endod. – 2016. – Vol. 42(7). – P. 1018-1021. Reliability of panoramic radiography in determination of neurosensory disturbances related to dental implant placement in posterior mandible / N. Kütük, Z. B. Gönen, M. T. Yaşar[et al. ]// Implant Dent. – 2014. – Vol. 23(6). – P. 648-652. Gaggl A. Navigational precision of drilling tools preventing damage to the mandibular canal / A. Gaggl, G. Schultes, H. Kärcher // J. Craniomaxillofac. Surg. – 2001. – Vol. 29(5). – P. 271-275. Efficacy of panoramic radiographs in the preoperative planning of posterior mandibular implants: a prospective clinical study of 1527 consecutively treated patients / L. Vazquez, N. Saulacic, U. Belser[et al. ]// Clin. Oral Implants Res. – 2008. – Vol. 19(1). – P. 81-85. Mehra A. Evaluation of dimensional accuracy of panoramic cross-sectional tomography, its ability to identify the inferior alveolar canal, and its impact on estimation of appropriate implant dimensions in the mandibular posterior region / A. Mehra, K. M. Pai // Clin. Implant Dent. Relat. Res. – 2012. – Vol. 14(1). – P. 100-111. Comparison between digital panoramic radiography and cone-beam computed tomography for the identification of the mandibular canal as part of presurgical dental implant assessment / C. Angelopoulos, S. L. Thomas, S. Hechler [et al.] // J. Oral Maxillofac. Surg. – 2008. – Vol. 66(10). – P. 2130-2135. Bartling R. The incidence of altered sensation of the mental nerve after mandibular implant placement // R. Bartling, K. Freeman, R. A. Kraut // J. Oral Maxillofac. Surg. – 1999. – Vol. 57(12). – P. 1408-1412. Lower lip numbness due to the mandibular canal narrowing after dental reimplantation: A case report / N. Shamloo, Y. Safi, K. Fathpour [et al.] // Dent. Res. J. (Isfahan). – 2015. – Vol. 12(4). – P. 386-388. 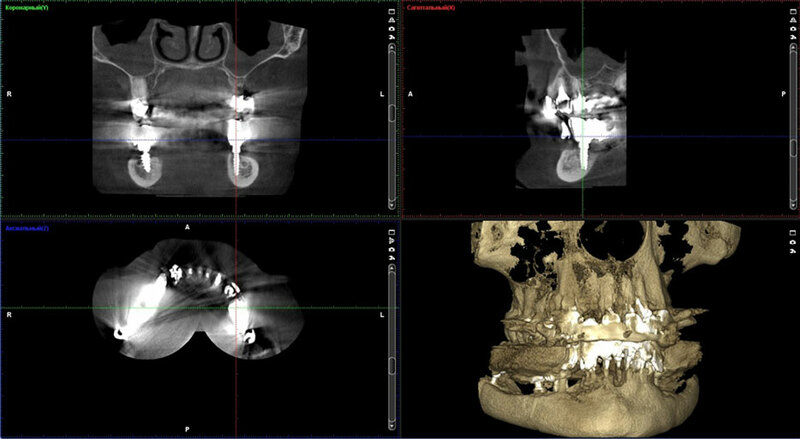 Preoperative assessment of the mandibular canal in implant surgery: comparison of rotational panoramic radiography (OPG), computed tomography (CT) and cone beam computed tomography (CBCT) for preoperative assessment in implant surgery / L. Pertl, B. Gashi-Cenkoglu, J. Reichmann [et al.] // Eur. J. Oral Implantol. – 2013. – Vol. 6(1). – P. 73-80. Comparative analysis of mandibular anatomical variations between panoramic radiography and cone beam computed tomography / F. S. Neves, M. C. Nascimento, M. L. Oliveira [et al.] // Oral Maxillofac. Surg. – 2014. – Vol. 18(4). – P. 419-424. Localizing the mandibular canal on dental CT reformatted images: usefulness of panoramic views / A. Takahashi, H. Watanabe, Y. Kamiyama [et al.] // Surg. Radiol. Anat. – 2013. – Vol. 35(9). – P. 803-809. Bone augmentation versus 5-mm dental implants in posterior atrophic jaws. Four-month post-loading results from a randomised controlled clinical trial / P. Felice, V. Checchi, R. Pistilli [et al.] // Eur. J. Oral Implantol. – 2009. – Vol. 2(4). – P. 267-281. Endosseous implant placement in conjunction with inferior alveolar nerve transposition: a report of an unusual complication and surgical management / A. H. Luna, L. A. Passeri, M. de Moraes [et al.] // Int. J. Oral Maxillofac. Implants. – 2008. – Vol. 23(1). – P. 133-136. Implant treatment in atrophic posterior mandibles: vertical regeneration with block bone grafts versus implants with 5.5-mm intrabony length / D. Peñarrocha-Oltra,, A. Aloy-Prósper, J. Cervera-Ballester [et al.] // Int. J. Oral Maxillofac. Implants. – 2014. – Vol. 29(3). – P. 659-666. Neurosensory function and implant survival rate following implant placement with nerve transpositioning: a case study / M. Hori, T. Sato, K. Kaneko [et al.] // J. Oral Sci. – 2001. – Vol. 43(2). – P. 139-144. Inferior alveolar neurosensory deficiency associated with placement of dental implants / N. Givol, O. Peleg, N. Yarom [et al.] // J. Periodontol. -2013. – Vol. 84(4). – P. 495-501. Dario L. J. Implant placement above a bifurcated mandibular canal: a case report / L. J. Dario // Implant Dent. – 2002. – Vol. 11(3). – P. 258-261. Reliability of implant placement with stereolithographic surgical guides generated from computed tomography: clinical data from 94 implants / A. E. Ersoy, I. Turkyilmaz, O. Ozan [et al.] // J. Periodontol. – 2008. – Vol. 79(8). – P. 1339-1345. Tilted implants for the rehabilitation of edentulous jaws: a systematic review / M. Del Fabbro, C. M. Bellini, D. Romeo [et al.] // Clin. Implant Dent. Relat. Res. – 2012. – Vol. 14(4). – P. 612-621. Immediate postextractive dental implant placement with immediate loading on four implants for mandibular-full-arch rehabilitation: a retrospective analysis / M. Mozzati, V. Arata, G. Gallesio [et al.] // Clin. Implant Dent. Relat. Res. – 2013. – Vol. 15(3). – P. 332-340. Chrcanovic B. R. Immediate implant placement in the posterior mandible: A cone beam computed tomography study / B. R. Chrcanovic, V. de Carvalho Machado, B. Gjelvold // Quintessence Int. – 2016. – Vol. 47(6). – P. 505-514. Sensitivity and specificity of radiographic methods for predicting insertion torque of dental implants / A. R. Cortes, H. Eimar, S. Barbosa [et al.] // J. Periodontol. – 2015. – Vol. 86(5). – P. 646-655. The midline mandibular lingual canal: importance in implant surgery / A. C. Oettlé, J. Fourie, R. Human-Baron [et al.] // Clin. Implant Dent. Relat. Res. -2015. – Vol. 17(1). – P. 93-101. Anterior Loop of the Mandibular Canal-A Source of Possible Complications / G. Gómez-Román, N. V. Lautner, C. Goldammer [et al.] // Implant Dent. -2015. – Vol. 24(5). – P. 578-585. Implant Injury Case Series and Review of the Literature Part 1: Inferior Alveolar Nerve Injury / J. Du Toit, H. Gluckman, R. Gamil [et al.] // J. Oral Implantol. – 2015. – Vol. 41(4). – P. 144-151. Anatomic variations and lesions of the mandibular canal detected by cone beam computed tomography / G. M. Leite, J. P. Lana, V. de Carvalho Machado [et al.] // Surg. Radiol. Anat. – 2014. – Vol. 36(8). – P. 795-804. Maló P. „All-on-Four“ immediate-function concept with Brånemark System implants for completely edentulous mandibles: a retrospective clinical study / P. Maló, B. Rangert, M. Nobre // Clin. Implant Dent. Relat. Res. – 2003. –Vol. 5. – Suppl. 1. – P. 2-9. A pilot study of complete edentulous rehabilitation with immediate function using a new implant design: case series / P. Maló, A. Nobre Mde, U. Petersson [et al.] // Clin. Implant Dent. Relat. Res. – 2006. – Vol. 8(4). – P. 223-232. Malo P. Immediate rehabilitation of completely edentulous arches with a four-implant prosthesis concept in difficult conditions: an open cohort study with a mean follow-up of 2 years / P. Malo, A. Nobre Mde, A. Lopes // Int. J. Oral Maxillofac. Implants. – 2012. – Vol. 27(5). – P.1177-1190. Immediate loading of full-arch fixed prostheses supported by axial and tilted implants for the treatment of edentulous atrophic mandibles / E. Agliardi, M. Clericò, P. Ciancio [et al.] // Quintessence Int. – 2010. – Vol. 41(4). – P. 285-293. Bone level changes around axial and tilted implants in full-arch fixed immediate restorations. Interim results of a prospective study / L. Francetti, D. Romeo, S. Corbella [et al.] // Clin. Implant Dent. Relat. Res. – 2012. – Vol. 14(5). – P. 646-654. Rationale for tilted implants: FEA considerations and clinical reports / G. De Vico, M. Bonino, D. Spinelli [et al.] // Oral & Implantology. – 2011. – N. 3-4. – P. 23-33. Posterior partially edentulous jaws, planning a rehabilitation with dental implants / D. R. Monteiro, E. V. F. Silva, E. P. Pellizzer [et al.] // World J. Clin. Cases. – 2015. – Vol. 16. – N. 3(1). – P. 65-76. The clinical relevance of bifid and trifid mandibular canals / K. Mizbah, N. Gerlach, T. J. Maal [et al.] // Oral Maxillofac. Surg. – 2012. – Vol. 16. – P. 147–151. Kieser J. The course and distribution of the inferior alveolar nerve in the edentulous mandible / J. Kieser, D. Kieser, T. Hauman // J. Craniofac. Surg. – 2005. – Vol. 16(1). – P. 6-9.